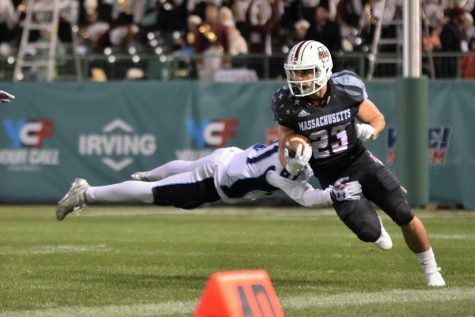 The Massachusetts football team has endured its fair share of bad losses and disappointments over the past few years. 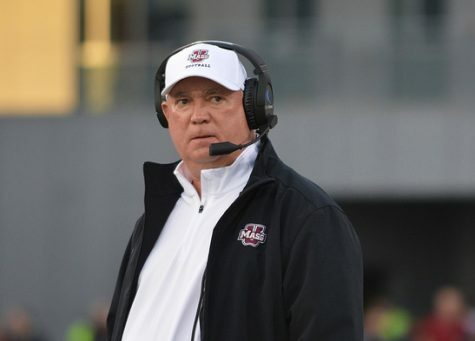 There have been missed late-game field goals and questionable play calls among other things, but never has UMass (1-5, 0-2 Mid-American Conference) laid an egg as bad as it did Saturday against Kent State. 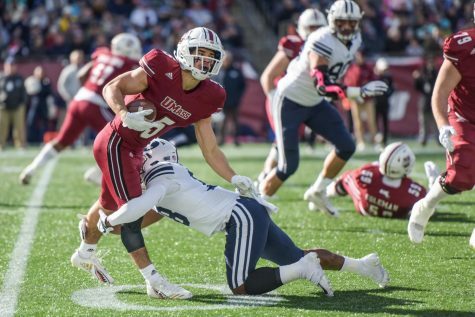 The Minutemen­ – known for their offensive play headed by coach Mark Whipple, quarterback Blake Frohnapfel and wide receiver Tajae Sharpe – finished with just 120 total yards of offense in the second half of a 15-10 loss against the Golden Flashes (3-4, 2-1 MAC) in front of 15,217 on UMass’ annual homecoming weekend. “I’m the quarterback in a pass-happy offense. When we’re not doing as well, a lot of the responsibility falls on me. I’ll take responsibility for that,” Frohnapfel said of the team’s offensive performance. 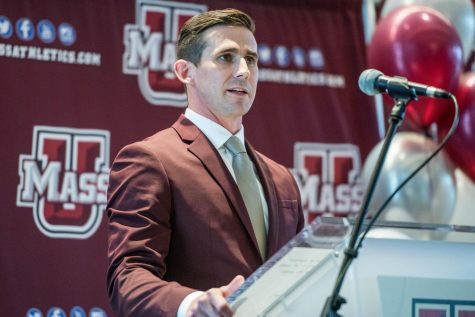 UMass totaled a season-low 257 yards of total offense and were forced to punt seven times with four of its own offensive drives starting from within its own 20-yard line. The Golden Flashes took the lead for good with nine minutes, 14 seconds, when Shane Hynes converted a 39-yard field goal to put them ahead 13-10 after the Minutemen defense had made one of its eight third down stops. The only other points in the second half came when Frohnapfel was called for a safety trying to escape Kent State’s pressure in UMass’ own end zone to give the Golden Flashes a 15-10 lead. “They basically ran the perfect coverage on the play we had called. I probably should have stepped up. It was one of those situations where you’re on the goal line so you’re scared of getting around too much pressure,” Frohnapfel said. 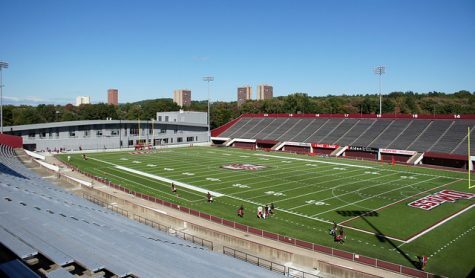 After allowing a season-high 725 yards of offense and 62 points last weekend against Bowling Green, the Minutemen defense held Kent State to just 327 yards of offense, with its lone touchdown came via a one-yard play-action pass from George Bollas (20-for-25, 135 yards, one touchdown and one interception) to Charles Chandler with 3:14 remaining in the first half. 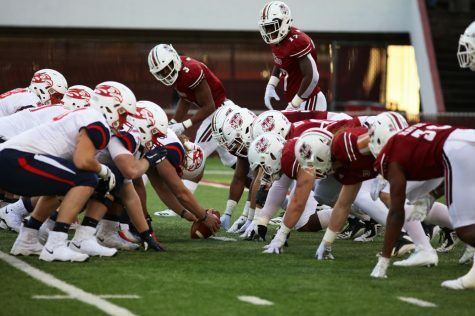 UMass’ defense forced the Golden Flashes into punts on six of its last seven offensive possessions, with the last one ending in a quarterback kneel when it had no remaining timeouts. 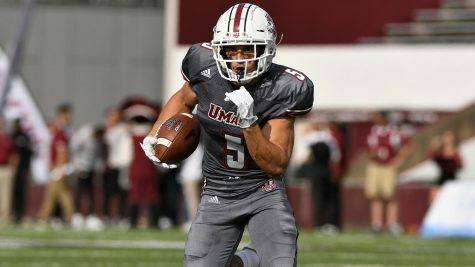 The Minutemen’s only offensive results came in the first half after Jamal Wilson opened the game with a five-yard touchdown run on a run-heavy drive to put them ahead 7-0 with 14:13 remaining in the first half. Logan Laurent then converted on a 28-yard field goal to give UMass a 10-3 lead. 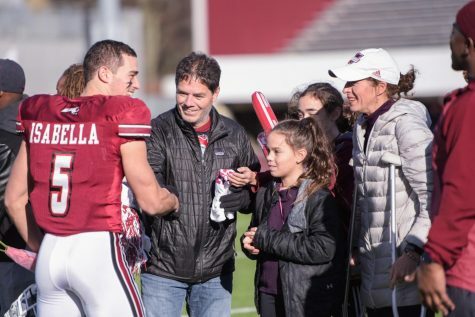 On that drive, Frohnapfel found Sharpe (seven receptions, 46 yards) for a 25-yard third down competition that made him its program’s leading receiver, passing Adrian Zullo’s previous mark of 2,982 yards. Whipple credited Frohnapfel’s first half interception as the turning point of the game. “When that interception hit, their guys seemed to get like half a step faster. I thought we had them on the hopes and then that just looked like they played a little bit faster than us. 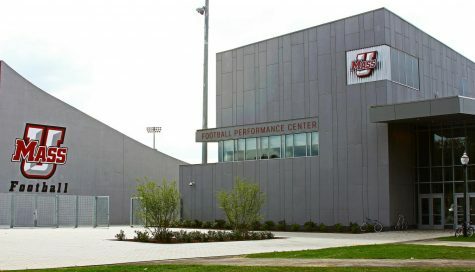 We needed to make a play and we just didn’t get it,” Whipple said.